feature-rich web solutions for my clients. Below is a collection of various projects I've completed for clients and for my own growth as a developer. If you like what you see, I would love to discuss your needs for a custom web solution. Please feel free to drop me a line, below. 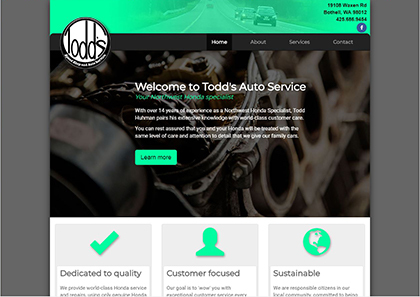 The client wanted a simple, fast-loading web site that provides contact information for Todd's Auto Service and a description of what services they offer. Site features include responsive design that scales based on the device size, a Testimonials section that includes Facebook reviews, and an interactive map on the Contact page. I built this site for a freelance photographer who wanted to showcase her work and start building a web-presence through regular blog posts. 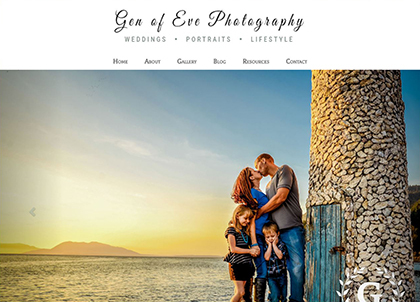 Built from scratch using WordPress, this site features a robust photo gallery, a blog page, and an interface that allows her to refresh content on her website as her business grows and changes. 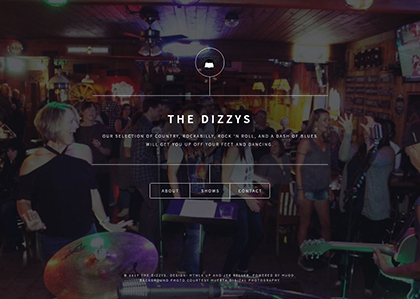 The goal with The Dizzys' web site was to provide a fast, responsive place for fans to connect with the band. The Shows page integrates with the band's Bandsintown account. When members add a show on Bandsintown, the site updates automatically, avoiding the need to update the website directly. In addition, there is a contact page that allows fans and booking agents to connect with the band via email. I love helping people, and I enjoy a good challenge. Being a devloper allows me to put both of them together, which means I get to tackle unique feature requests, and my clients get a web solution that fits their needs exactly. In my spare time (ha! ), I enjoy creating and playing music and spending quality time with my family. Thank you for taking the time to reach out! I will respond to your message within 24 hours.